Not many people know that Apple cofounder Steve Jobs and former President Bill Clinton were friends. Not only did they hang out, the Clintons would use a house owned by Steve Jobs in California when they flew west to visit their daughter Chelsea at college. And I got the Clinton Presidential Library's documents and photos of Steve Jobs released under the Freedom of Information Act (FOIA). You can read my story about Jobs and Clinton over at Gizmodo, but I've uploaded the raw photo contact sheets here. The entire 39 pages of textual documents is available here. The Clinton Library charges $16 per high-resolution scan for photos and they can be purchased from the library now that they've been processed. Records that are responsive to this FOIA include various correspondence between the President and Mr. Jobs including Jobs’ unsolicited recommendations for a new Surgeon-General and Secretary of Defense, Christmas greetings, and an invitation to a special screening of the Pixar film “A Bug’s Life”. This collection also includes a copy of a New York Times crossword puzzle in which Mr. Jobs is the answer to one of the clues, and a copy of a thank you note from the President to Mr. Jobs for his charitable donation of computer terminals to the people of Kosovo. Presidential libraries process FOIA requests for photos by event, so most of the photos in this release aren't of Steve Jobs. 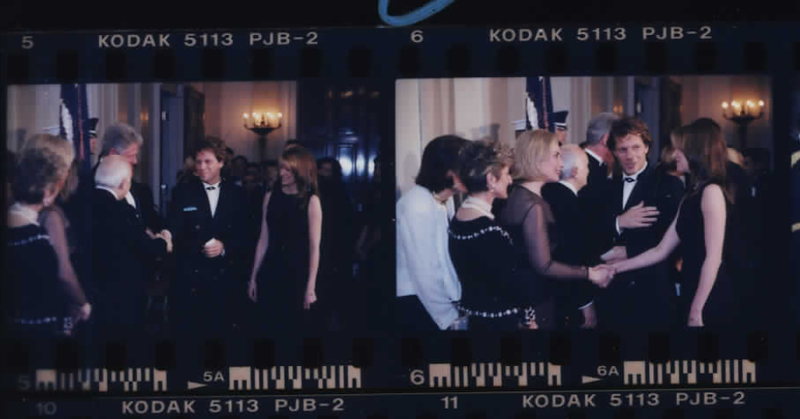 Some notable photos appear below, including shots of Sophia Loren, Nic Cage, John Bon Jovi, Martin Scorsese, Joe Paterno, Patrick Stewart, Bob Weinstein, journalist Diane Sawyer, former President Jimmy Carter, Chinese President Jiang Zemin, and many more politicians and celebrities.